I loved the colors of the inset design, how it bowed in the center, and the large flower placed in the center with the two smaller ones at top and bottom. So, I knew I had to stick with that. I used Very Vanilla for the base and it is the perfect back drop for the Regal Rose and Sage Shadow panel. 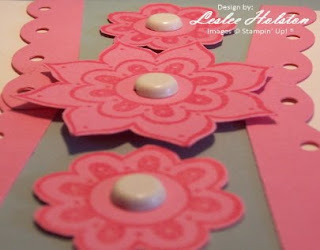 I used the corner rounder punch to scallop the panel edges and the 1/8" circle punch in each scallop. 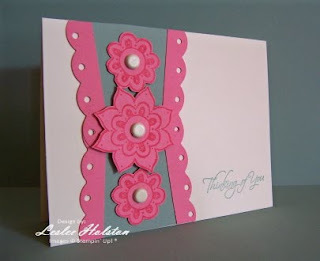 The flowers are from the One of a Kind set and stamped in Regal Rose. The Vanilla 5/16" brads in the centers bring it all together. 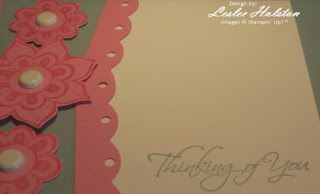 The sentiment is from Kind & Caring Thoughts (hostess set). I love the simplicity of this card. Remember, it is for the CAS (Clean & Simple) challenge. Let me know what you think. Your comments are welcome. I love to read them.